Geofencing is the revolutionary way to protect your most valuable vehicles and assets and is available simply by installing GPS vehicle tracking devices. When you install GPS tracking devices in your vehicles the you will now be able to monitor the location of your vehicle using any mobile device, tablet or PC. 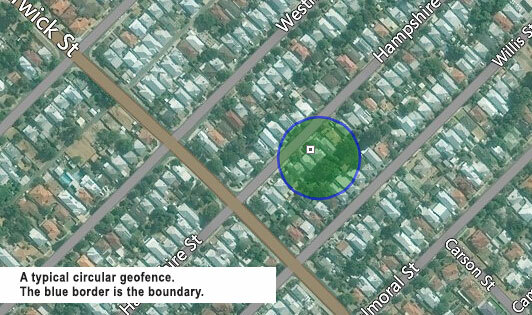 By using the geofencing capabilities of the monitoring software you can establish an electronic perimeter or a virtual fence and if your vehicle leaves that perimeter then you will receive an automatic notification allowing you to take the appropriate action. The perimeter needs to be large enough – say 250m to avoid false triggering. These goefence “perimeters” can be temporary e.g. when leaving your car at a train station car park, or a permanently set – e.g. your garage at home. Geofencing has numerous benefits to vehicle owners and also gives you peace of mind when you must leave your vehicle with a third party. When you are traveling and leave your vehicle parked in a long term parking lot you will be able to monitor the safety of your vehicle while you are away and enjoy your trip knowing that your vehicle is safe where you left it. If it is moved – say by being towed or by theft, you will receive a SMS text alert and an email informing you from the GPS vehicle tracking device (and system). Then you can follow it’s movements via Live Tracking software and take appropriate action. Another useful application is knowing when are where your mechanic is testing your vehicle after a service, or if they are abusing it on a long joy ride. fleetminder provides two ways to set geofences with their brand of GPS trackers. With the geofencing capabilities of GPS vehicle tracking devices you will gain valuable peace of mind knowing that your vehicle is safe no matter where you leave it.